If your kids are bouncing off the walls, why not take them to a trampoline park where they won’t tip over a lamp? Trampoline parks, usually located within large warehouses, are filled with a variety of trampolines. Customers can bounce and jump in any direction, slam-dunk basketballs, do flips and other gymnastics moves, and play dodgeball with foam balls. What’s not to love? Trampoline parks are popping up in cities all across the nation, but with them come questions of safety. Evidence of their popularity is the fact that they are the fastest growing segment of the amusement park industry. The medical community is concerned about the popularity of the parks because of the risk factors. The American Academy of Pediatrics advises that trampolines should not be used by any child except for training programs and certain sports – and only then when supervised by a trained adult. The most recent statistics furnished by the U.S. Consumer Product Safety Commission are from 2010 where 92,000 injuries were treated in emergency rooms. However, that number doesn’t distinguish between residential or trampoline park sustained injuries. A better gauge would probably be by counting ambulance visits to trampoline parks. Trampoline enthusiasts will tell you there is chance of injury in any sport, and that the risks are minimized in trampoline parks by the equipment, rules and supervision provided. Many parks mix ages for jumpers and/or don’t limit number of people jumping at one time. Participants are required to sign a liability waiver, so customers jump at their own risk to the extent that courts will uphold waiver/release agreements. With reports of broken necks, shattered leg bones, concussions and one death, some doctors believe that the risks overshadow any benefits. Governments are starting to take notice of the injury rates, Utah and California were among the first states to address concerns about safety in the burgeoning industry. Michigan passed legislation earlier this year. 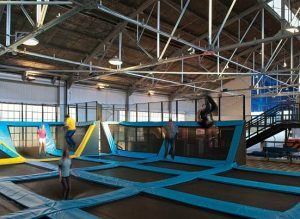 Also, the new ASTM F2970-13 standard set the bar high for trampoline park safety standards that are contained within the 22-page document. However, these standards are voluntary at this time. Before heading out, visit the park’s website. Read their safety information. Talk to your children in advance about safety issues. When you arrive at the park, read the posted safety information with them. Avoid peak hours, especially in the evenings and on weekends and holidays. Instruct kids to stay away from larger participants and to avoid crowded situations.